“While production of this age is also equipped with a MIDI. Patch memory 64 sound, 8 voice specification. “Fully functional. Recently serviced and cleaned. Wooden side cheek has a crack and there is a hairline crack on the lowest key (as seen in a photo), but triggers and has no effect on normal playability. “It was released models in the mid-1980s. While production of this age is also equipped with a MIDI. Patch memory 64 sound, 8 voice specification. Polyphonic synth with a look reminiscent of the Prophet. Although the sound makes feel a little cheap of, there is a unique charm. Because the model not seen quite as well in the used market, who became worried as soon as possible! ! “It is a compact polyphonic synthesizer with looks reminiscent of Prophet. It was launched in the mid 1980’s, with MIDI installed while manufacturing in this age, patch memory 64 sounds, 8 voice specifications. With a flat design with almost no knobs etc. after DX 7, there is a white board in the center of the body, you can write notes such as patches. It is now difficult to edit sounds, but the sound is an analog sound like SCI. Maintained by a specialist. The operation is good. 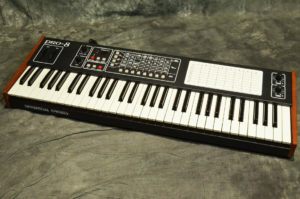 “Pro-8 is the Japanese version of the Split-8. An extremely underrated synth with a distinct sound. It has been recently serviced and sounds excellent. The instrument can be 8 note polyphonic, offers powerful 8 note unison and, in dual mode, you can also layer two sounds for rich, 4 note polyphonic textures. Furthermore, sounds can be edited when in dual mode, so that sounds created can be very complex and versatile. Even though it does not have separate controls for every parameter, programming the Pro-8 is very easy, thanks to very smart parameter-selection matrix. “As I tested the unit I noticed a few of the keys have bad contacts, with MOD wheel seem to be not responding and the PITCH wheel not responding on high bend (low bend worked fine). There is also a bad contact and chattering when controlling the VALUE knob as well as on some of the buttons. Besides the issues mentioned above all other functions worked fine to the best of my knowledge, all the Programmer edit appears to work fine, and I was able to Record new patch programs. I have not being able to test if the keys are in correct pitch. ” Ich verkaufe hier einen Pro 8 VCO Synth von “Sequential Curcuits” die Japanische/USA Version des Split 8. Hier erhält man den den Phantastischen Pro-Sound mit 8 Stimmen, fett und druckvoll. Double, Unisono und Split Modus möglich, klingt wie Sahne. “The unit appears to be working fine, all the keys and sliders and buttons working well as I tested, as well as writing/editing patch programs. One thing I noticed is the LED light on Preset button seem to be not lighting up, but the function itself is fine. Cosmetically the unit is in nice and reasonable condition as you can see. There are some wear and scuff marks here and there, but nothing too major. I’m including plenty of pictures so you can see exactly how it looks. The unit appears to be working fine, all the keys and sliders and buttons working well as I tested, as well as writing/editing patch programs. Cosmetically the unit is in very nice condition as you can see. There maybe some minor wear and marks here and there, but nothing major at all and have been looked after well. I’m including plenty of pictures so you can see exactly how it looks. 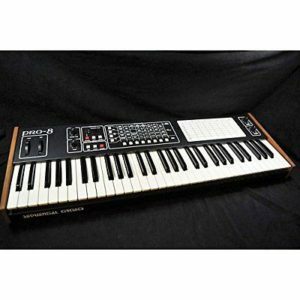 Comes in an original Sequential Circuits PRO-8 Hard Case as shown. “THIS IS A SEQUENTIAL CIRCUITS PRO 8 IN GREAT CONDITION. COMES WITH MANUAL. This 8-voice-one-OSC/4-voice-two-OSC SOUNDS GREAT. One interesting oddity is that you can Filter FM one patch with another patch when they’re stacked in “double” mode which can yield some very unusual results, allowing for some surprisingly powerful “signature” sounds. ” Auction ended. Click here to browse on eBay. “Hello. This should get you rocking on your chair. I imported this vintage synth from Japan in 2006. It would make an exellent investment for either collector or player, or both. 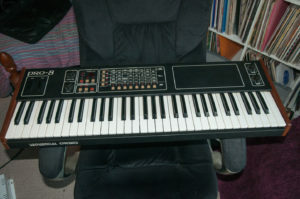 Please could you review this synth yourself as I havnt got the time to make a huge patches & technical listing of this rare & collectable synth other than to say it is in very good condition & perfect working order with no issues & comes with a Sequential circuits Pro-8 operation manual on paper in English & Japanese, issued March 1985, & Pro-8 manuals on disc, & Pro-8 Patches on disc, & a power supply unit, all in its original box. ” Auction ended. Click here to browse on eBay.